How about listening to the singing birds instead of the honking horns in the morning? How about living the life of a Maharaja instead of running you own errands this vacation? A Palace on Wheels trip to Bharatpur National Park is a dream come to true for nature lovers and people willing to spend a lavish vacation. Is spread over a massive area of 12 square miles. It is filled with dense woods, swamps, wet prairies and savanna. It is home to almost 370 types of avian species; 150 types are migratory birds which have flown from Western parts of China, Siberia and Central parts of Asia. Mallards, geese, storks, teals, black headed Ibis, sparrows and ducks are some of the most popular birds seen here. Lohagarh Fort, located within the jungle is of historic importance as Maharaja Suraj Mal built this to fight against the Mughals and the British. There are three palaces within the castle, namely, Mahal, Mahal Khas and Kothi. The Palace nestled within the National Park is a blend of Rajput and Mughal architecture. It is decorated with lovely tiles and is a treasure house of royal belongings and artefacts. Out of 8 victory towers built by Maharaja Suraj Mal, Jawahar Burj and Fateh Burj are of special attraction due to the architectural design. The Government Museum is a must visit to witness some of the valuable inscriptions narrating Indian art and culture and finely carved sculptures. 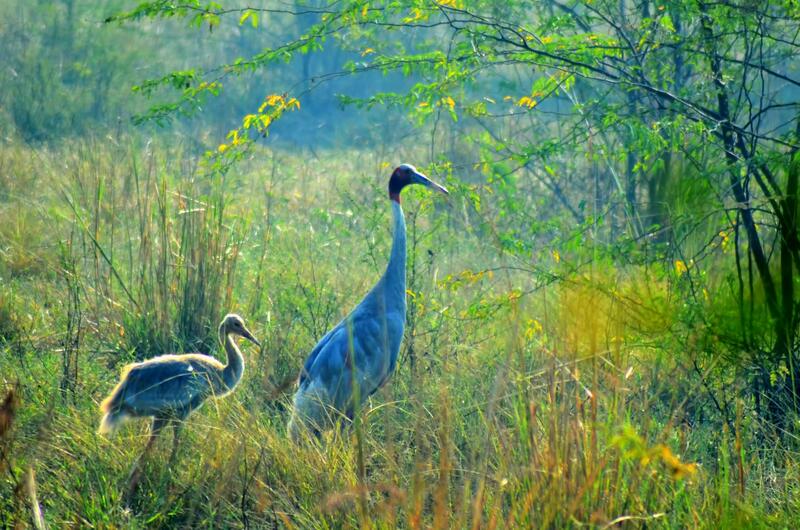 Tourists are also taken to Deeg, an isolated land with large fortifications and sprawling green gardens; it is located just 22 miles north of Bharatpur. Palace on Wheels is a luxury train ranked as 4th best in the world. In its 7 days trip, the train reaches Bharatpur on the last day. Before you reach Bharatpur and that your eyes with natural beauty and rich flora and fauna of the country you are taken to the majestic palaces and gigantic forts of Rajasthan, white edifice of Taj Mahal and to the land of tigers, the Ranthambore National Park. Price are very cost-effective in comparison of other luxury trains. Checkout the fares of Palace on Wheels train and avail the world-class amenities onboard the train. Staying at air conditioned coaches, spacious and equipped with big beds, vintage furniture, large wall mirrors and attached bathroom. Relishing authentic Rajasthani and global cuisines at the beautifully crafted dining cars of the train. Spending some time in solitude reading from a large collection of books or enjoying board games with friends and family. Sipping some of the finest wines of the world or tasting some exotic mock tails prepared on-board. So combine reality with nature this holiday by embarking on a royal journey on Palace on Wheels.